Although physicians, attorneys, economists, and many other professionals often are primary players in developing and managing water resources, engineers play a significant role in water resources management. Potential employers include large and small businesses; government at all levels; corporations that are local to national and multinational in scope; and schools and universities. Even self-employment as engineering consultants and other technically applied positions is an expanding career option for water resource engineering professionals. To become an engineer requires a formal education at the college or university level, and advancement in the profession calls for professional registration by state-level agencies. Engineers work alongside, and often supervise, other workers such as technicians, surveyors, draftsmen, and computer programmers. General engineering functions include research, development, design, production, construction, operations, sales, and management. Other engineers are involved in testing, teaching, and consulting. In all these activities, engineers seek to understand the laws of science and mathematics and to put these laws to practical use for the improvement of society and civilization. Engineers seek out and apply practical solutions to technical problems. This role has not changed since the origins of engineering in ancient times; only the objectives pursued, the techniques used, and the tools available for analysis have changed. Advances in developing new materials and in the capabilities of modern computers for analysis and design combine to make many forms of engineering, particularly the specialties in the water sciences, attractive career choices. Young people planning careers in engineering should seek the best and most thorough background possible in mathematics and science from their secondary school. Study of algebra, geometry, and trigonometry is essential, and classes in calculus and other "higher" mathematics courses are desirable. Other branches of science that are important to water resources engineering include chemistry, physics, and biology. As in every modern career field, familiarity with computer applications is essential; word processing and electronic spreadsheets are basic applications, and students will also be introduced to software design and programming of computer code. Water resources engineering encompasses many specialties. 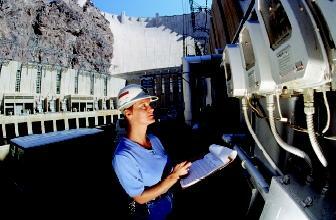 Here an engineer reads gages at the Hoover Dam. for success in their college work. Introductory engineering course work is available at most community colleges. However, aspiring engineers will complete their bachelor of science degree work at colleges and universities accredited by the Accreditation Board for Engineering and Technology (ABET), the national agency recognized by the U.S. Department of Education to monitor and evaluate engineering education programs. ABET provides world leadership for quality innovations in engineering, technology, and applied science education. Degree programs that will prepare graduates for engineering careers in the water sciences include civil engineering, environmental engineering, hydrology, water resources management, and others with similar functions. Almost all are nominal 4-year programs, but heavy course loads and the increasing popularity of cooperative degree programs, which alternate periods of study and work, often extend the work beyond 4 years to 5 (or more) years. The employment market, usually favorable for graduating engineers, was exceptionally good as the twenty-first century began. Young engineering graduates almost always have their choice of several employment opportunities, and signing bonuses and other benefits are not unusual. As in all professional careers, the graduate should investigate and accept employment in positions that offer challenge and the opportunity for meaningful work and advancement, rather than just seeking the highest available salary offer. Graduate degree work is typically not expected for initial employment with a company or other organization, but is becoming increasingly important for advancement, and is a good choice for all engineers early in their careers. Most employers are supportive, and will usually provide assistance for part-time master's-level study. Engineering students with a strong undergraduate record can usually study full-time with tuition and fees paid for them while working as teaching or research assistants at research universities. These positions are normally applied for at the schools of the student's choice during the fall months for study beginning the following summer. Registration as a Professional Engineer (PE) is legally required in most states to be "in responsible charge" of major engineering projects. State registration boards conduct examinations and certify the experience requirement for PE status, which is four years in most states. Students can begin this process by passing the Fundamentals of Engineering (FE) examination during their final year of undergraduate study. SEE ALSO Army Corps of Engineers, U.S. ; Careers in Environmental Science and Engineering . Burghardt, M. David. Introduction to the Engineering Profession , 2nd ed. New York: HarperCollins, 1995. National Research Council. Opportunities in the Hydrologic Sciences . Washington, D.C.: National Academy Press, 1991. Oakes, William C. et al. Engineering Your Future . Wildwood, MO: Great Lakes Press, 1999. Wright, Paul H. Introduction to Engineering , 2nd ed. New York: John Wiley & Sons, 1994.